Today, Friday April 14 saw the return of another moderate flight of birds over the dunes. Though winds were east overnight, they quickly turned southeast after dawn, which served to facilitate some migration today. The icterid flight was lower than has been seen in recent weeks, but when combined with the overall diversity of birds, it … Continue reading A Good Friday Count! An Old Fashioned Dunes Hawk Watch! Sunday, April 24, saw the return of another dunes longshore flight count after two days of unpleasant weather. Winds were late to turn to the south, finally shifting after midnight, resulting in the sunrise temperature being a chilly 49 degrees as the south winds started picking up. As such, little arrived as far as new … Continue reading An Old Fashioned Dunes Hawk Watch! Warm air and humidity spilled into the region today and allowed a few good birds to slip into the area. Unfortunately, the 5 day forecast doesn't look too good for any huge influxes of migrating birds. But, today's dune daily download will likely keep the area habitats with worthy birds to seek out through the … Continue reading Swainson’s Hawk! 3 warblers added, & a nice flock of plovers. Along came a cold front. 5 more species for this season’s list. Cold winds & hot sun. 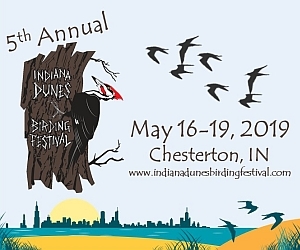 Join us at the Indiana Dunes Birding Festival!